What Shall We Celebrate on World Rhino Day? It is no way to kick off World Rhino Day. Little Bahati, from Kenya’s Tsavo National Park, had already been the victim of rhino poachers when they shot and killed his mother last year, taking her horns and orphaning the defenceless rhino calf. That night, Bahati had also taken a bullet, yet he survived his injuries and continued to thrive in the wild. Over the weekend, though, the rhino-poaching crisis that has swept sub-Saharan Africa over the last eight years caught up once again with the young Bahati. On September 15, Bahati was spotted with a wire snare wrapped tightly around his neck, cutting deep into his flesh. Kenya Wildlife Service, Big Life Foundation (an AWF partner), Tsavo Trust and the David Sheldrick Wildlife Trust all sprang into action, scrambling foot and aerial patrols to track the struggling calf. After four days of dawn-to-dusk tracking, rangers managed to spot, dart and sedate Bahati in order to treat his wounds. In spite of their heroic efforts, Bahati succumbed to his injury on September 19. While it is sad that World Rhino Day should be greeted with such tragic news, the daily, monthly, annual efforts of all conservation groups and wildlife authorities fighting to protect Africa’s (and Asia’s) rhinos—including those involved in Bahati’s search—should be acknowledged, commended and celebrated. Without the work of these groups, there might not be any rhinos around to celebrate. 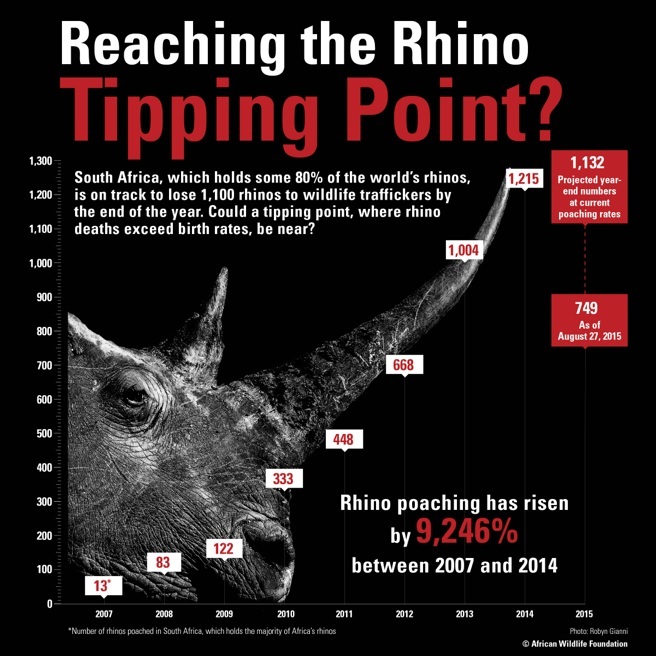 South Africa continues to be a bellwether for rhinos in Africa. Holding some 80 percent of the world’s rhinos, the southern African country is hard hit by poaching year after year—and 2015 appears to be no different. In spite of this, there are reasons for hope. Never has the world’s attention been so focused on the plight of the rhino, and never have so many resources been invested in protecting this iconic pachyderm. As African Wildlife Foundation CEO Patrick Bergin notes: “We are reaching a tipping point and have an incredible groundswell of support and action toward the protection of Africa’s rhinos and elephants, not just from conservationists but from governments, international bodies, civil society and the private sector. We must continue and double our efforts in order to tip the odds back in the rhino’s favour, back toward its long-term survival." AWF has provided critical transportation and equipment to key reserves, conservancies and national parks throughout Africa, which are home to vulnerable populations of black and white rhinos. In one South African reserve, AWF underwrote the purchase of an anti-poaching helicopter, which has, since becoming operational, foiled poachers’ attempts to poison rhinos on the reserve; helped rescue and translocate a rhino calf whose mother was killed by lions; darted and saved an elephant whose leg had been snared; tracked and arrested poachers on the reserve; and contributed to a reduction in the number of rhinos poached overall. AWF is providing similar support to other protected areas in South Africa, Zimbabwe, Kenya and Namibia. In 2014, AWF launched its Conservation Canine Programme, a robust training program based in Tanzania that trains detection dogs alongside their handlers throughout the continent to detect ivory and rhino horn at seaports, airports, border crossings and other trafficking hotspots. To date, two teams from Kenya Wildlife Service and Tanzania’s Wildlife Division have undergone the intense training and are currently setting up shop in Mombasa, Kenya and Dar es Salaam, Tanzania. The first class was trained on detecting ivory but subsequent classes of dogs and their handlers will be trained to detect rhino horn as well. AWF is now reviewing the next class of dogs and handlers to be trained, likely from Ethiopia, Uganda and/or Mozambique. A consumer survey conducted in 2012 and then again in 2014 by AWF and its partners WildAid and Save the Elephants revealed that awareness in China about the devastating impact of the ivory and rhino horn trade on Africa’s wildlife had grown significantly after two years of intensive public awareness campaigns. The survey revealed that respondents who believe rhino horn has medicinal properties dropped by 23.5 percent. There was also a 51.5 percent increase in awareness between 2012 and 2014 that rhino horn came from poached rhinos. The majority of respondents were in favour of a ban or stricter regulations around the rhino horn trade. To date, AWF and WildAid are continuing to conduct public awareness campaigns in Asia, producing public service announcements with influential celebrities such as actor Jackie Chan, former NBA star Yao Ming, Vietnamese-American actress Maggie Q, actor Edward Norton and others. 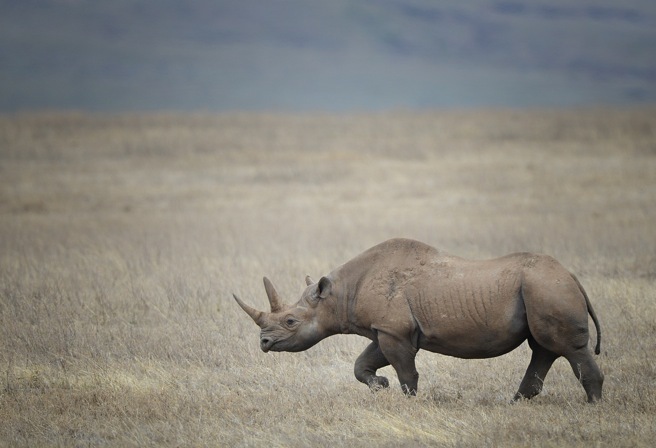 Industry leaders such as Sir Richard Branson and Vietnamese stars such as Thanh Bui are leading the chorus among the private sector and civil society in Vietnam to protect rhinos. Sir Richard recently hosted a private dinner for some of Vietnam’s most influential business leaders, where he and his guests signed a pledge never to buy, sell or trade in rhino horn. Also present at the dinner was popular Vietnamese singer, Thanh Bui, who joined other celebrities and pop stars last month for a two-hour, nationally broadcast show on Vietnam Television. With rumors that South Africa might table a proposal to legalize rhino horn at the 2016 CITES meeting in South Africa, AWF’s vice president of species protection, Dr. Philip Muruthi, publicly registered AWF’s opposition to such a move, writing directly to South Africa’s Department of Environmental Affairs and penning an op-ed in the Mail & Guardian. AWF has also joined other conservation groups in opposing the introduction of synthetic rhino horn into Vietnam and China. Both legalization of rhino horn trade and the introduction and promotion of a rhino horn synthetic would be disastrous for Africa’s rhinos, stimulating an unknown market for rhino horn, complicating law enforcement efforts to crack down on the illegal trade, and reversing the gains that have been made to shift attitudes in both Vietnam and China away from viewing rhinos and their parts as hot commodities.